cardigans and kids: some weeks require extra chocolate. some weeks require extra chocolate. I seldom make rice crispy treats. When I do, it is usually for a kids event at church because they are quick and most kids like them. After making the normal version up for church last night, the girls and I made these. They are nice and thick. The bittersweet chocolate makes them a bit more grown-up, although, the girls who didn't think they would like them, did. 1. Butter an 8 inch square baking pan. Line bottom and sides with partchment paer, leaving 2-inch overhang on both sides. Butter paper, set aside. 2. In large saucepan, combine butter, marshmallows and cocoa. cook over medium heat, sirring frequently, until melted (about 6 minutes). Stir in rice cereal. 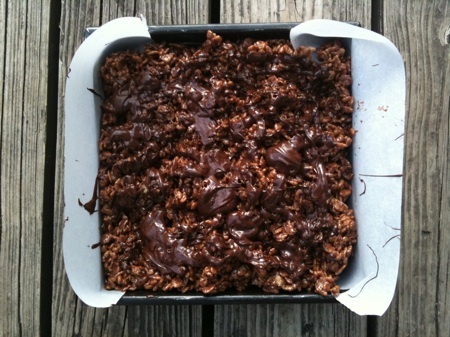 Press mixture into prepared pan, drizzle with melted chocolate. Let cool to room temperature. To store, keep in an airtight container at room temperature, up to 5 days. *They are a great dessert for a lunchbox too!